The Saturday before Easter we tried out the city's Easter egg hunt at the high school. It wasn't bad but rather than put candy in eggs they just threw it around on the taped off ground. This makes sense seeing that to fill eggs takes so long, but what was funny was that they must have disbursed the candy much earlier that day (the hunt was at 1pm) because all the candy was completely melted by the time the kids got to it. It was so funny to see all the little kids licking their hands and fingers. We just threw ours in the freezer and they turned out fine but we got a chuckle out of that. Later that night, after Ty got off work, we had our own little hunt in our house. We're having to get really sneaky about where we hide the eggs because the kids are such good seekers. And boy did Rosie get into it this year - she loved it! Ah...she found a big one! Cash was in the habit for a few days of wearing his old 3-D glasses for some reason. I thought he actually looked pretty cute in them. And look at that smile! With every egg Rosie opened she gave a delighted and exaggerated gasp when she saw the candy inside. Even though after the first several you'd think her enthusiasm would dwindle - it didn't! The kids in their new Easter Sunday clothes along with their Easter treasures. Vanna is now 6 years old! My little girl is not so little anymore! Ahhh! She had a wonderful day. It started with her request for cream of wheat at breakfast (her favorite) and opening presents. She got a new Sunday dress (which she needed terribly) the DVD Frozen (the new and very popular Disney movie ever little girl loves right now and sings songs from) and a hairstyling doll she can learn new braids on and play with. I told her I might even have to use it sometimes to master new hairstyles before trying them out on the girls. We decided to do all the celebrating for her birthday that day (even though it was a school day) rather than later on the weekend because Ty had her birthday off and not the weekend. So we checked Vanna out of school just over lunch/recess-time and went to Subway to eat (again her choice). Then later we took a cupcake cake to her class to celebrate for a minute in there. She was so excited for her dad to come to her class (I guess I'm old news :)! There's a rule at the school that only store-bought food items can be brought in. Apparently they had an issue once with food poisoning and quickly adopted this rule. So we ordered the cupcake cake from Albertsons in a Frozen movie design. She loved it and I think the most exciting part was that the design was made of edible paper - she couldn't believe you could eat it! Hahaha. While we were at it we just ordered a small Frozen cake we could share as a family at home and that we could stick candles in for her to blow out. Crazy excited at school when we were visiting! Her grandparents always remember to make her feel special on her birthday as well. They call to sing to her and send cards. She loves getting that mail and loved the pictures in her card this year that reminded her of the presents her Grandma and Grandpa had bought her a bit earlier in the year (the cute stuffed owl you see above). Vanna - As we were getting ready for church Vanna said something that made me laugh. We had been practicing our testimonies in FHE again so that they would feel prepared and able to share the truths they have simple testimonies of and I was explaining to the kids that since it was Fast Sunday, if they wished to bear their testimony, this would be the day to do that (our ward turns the first few minutes of testimony meeting over to the primary kids so that if they wish to bear their testimonies, that is the time - it often gives more kids the courage to do so since all their friends are going up there with them). Vanna says, "Wait, that's what Fast Sunday is?!" I said, "Yeah." and because I saw this blank look on her face, I went on to explain the way we skip meals to show our sacrifice and desire for the Holy Ghost to be with us...and so on...and so on. After I finished, Vanna said, "Oh. I just thought it meant we had to be fast, like get ready fast on Fast Sunday." Apparently we need to do better at explaining the "why" behind more of the things we just do automatically. And just because I'm curious - at what age have some of you encouraged your kids to start fasting? We haven't done so yet, well, because we figure they're to young to grasp the concept and too young to ask them to skip meals. I'd love to hear your ideas. Vanna learned to tie her shoes. She likely could have done this much earlier however, she had never even owned lace-up shoes to this point. She came home one day though and showed an interest in tying them so we started practicing on our shoes and she got it down pretty quickly. I guess I'll have to think about that next year when I buy her shoes for school. We finally took off the training wheels of Vanna's bike this summer - successfully. We had tried each summer the two summers previously (because we took Cash's off when he was four and he did great) but she was just too nervous without them so we put them back on. She is close to out-growing her bike though and we told her that the next bike we get her won't have training wheels so she better figure it out this year. And that was that. We took them off last Sunday and within 10 minutes she was riding solo and Dad was having to sprint next to her to keep up (to be there in case she fell). And it's like we bought her a new toy. She has been riding that bike everyday several times a day because she's so happy with herself. We're so happy for her too. Vanna is driven by music. She loves to dance and sing and is so so excited to start piano lessons this fall. I hope she finds she loves it - I think she'd be great at it and what a beautiful and useful talent to have. Her laugh is so contagious and she can get pretty filled with the giggles. She usually still takes an afternoon nap. Yep. She's six and still takes a nap - it's so good for her and I'll let my kids take naps for as long as possible. :) She is always so worried each day though about whether or not Cash is going to take a nap. It's important to Vanna that everything seem exactly fair and I've had to explain to her multiple times that when she's eight, she'll likely not need to take naps either. Vanna loves helping me in the kitchen, especially if it has anything to do with cracking eggs. On that note, she is a good enforcer especially with Rosie. I'll often hear her repeat things I apparently say on a regular basis like, "Don't you tell me no." or "Do you need to sit on the wall?" - she acts like she's the boss with her probably too often. And I find it so funny that she thinks like I do when it comes to the rules with Rosie but we do not see eye to eye when it comes to the rules with her (but it usually boils down to her need to hear an apology and to be heard - she just wants to express herself without explanations or disagreement, etc. hopefully I remember that when she's a teenager and we're butting heads because we're too much alike :). But truly, Vanna is so helpful to me with her little sister. I love to see them playing so well together especially considering the bit of a gap in age between them. Of course they argue well together too (I'm always telling her, "Vanna - you're arguing with a baby - stop." :) but they get along pretty well for the most part. Vanna is just a joy to us and holds her place as a middle child in our home so well. I worry about that often but she does well and is a good little sister as well as a good big sister. The moments are getting more and more rare that I get to snuggle with my big girl so I cherish the days like today where she comes to sit on my lap and says, "I like sitting on your lap Mom." Awww. I seriously need to find a way to keep these kids from growing up! Thought I'd just include a bunch of pictures I've taken over the past few months that are silly and make me smile. When ever we turn on the music the girls think they have to go get into their dress-up dresses to twirl around in. I tried to capture their creative outfits and after about the fifth picture - Rosie decided she didn't like the flash and started squinting. Still made for a pretty cute picture. Speaking of dresses and dress-up...those are two of Rosie's favorite things. For some reason she loves her Sunday dresses, sweaters and tights. Who loves tights right?! Well...Rosie does! She gets some pretty crazy outfits goin' on :)! Cash just couldn't resist the bubbles in the sink after washing his hands. Vanna had space camp at school one week this month and had a great time. She even got to try astronaut food! :) And this was her astronaut helmet they made in class. I think she'd make a darling astronaut don't you?! And we tried some new hair-dos for Miss Vanna Marie that turned out pretty cute. I need to be more creative more often rather than doing the same old thing all the time I guess. And speaking of creative, Cash got it in his mind that he wanted to make a robot. He asked me for some boxes and had the basic design for this robot all mapped out on his own. I thought it was pretty impressive that his Dad only had to help him put it all together so it would actually stand up. Every kid has their little quirks and Rosie is no different. And this is one in particular I always want to remember not only in writing but with a visual...a picture. For some reason, she has always put her little blanket up to her nose (either to smell or tickle her nose, we still can't tell) to comfort her as she wakes up fully in the mornings or from a nap. Gotta' love static from the tramp! Rosie likes to get into my drawer of Tupperware to play with and make a mess. Here she decided it was pretty fun to look through the lids and smash her face against them. If you know Cash, you know he likes to clown around...especially if it's with his Dad! This picture is just the tip of the iceberg in displaying Rosie's love for my lip gloss. She asks for some every morning when she sees me getting ready. I've resorted to hiding them in my closet because she would sneak into my drawer and I'd often find nearly full tubes layered all over her face. Rosie likes to ride on the side of the tub as if it's a horsey. And last but not least (for now on the blog anyway - didn't feel the funny pictures of Vanna in her undies were quite blog-appropriate :), I wanted to catch Rosie in the act of placing items in a long line and in perfect order the way she often does (whether its pens one day or on another day all her hair bows). I wonder where she gets her organized tendencies? Hahaha. When we first moved to Payette it was like a magnet drew us to the Wilcox family and we became fast friends. At that time, we had two kids and they had three girls and our kids played so often, we realized they treated each other almost like siblings (and I'll never forget how Cash called Lizzy Fuzzy for the longest time :). 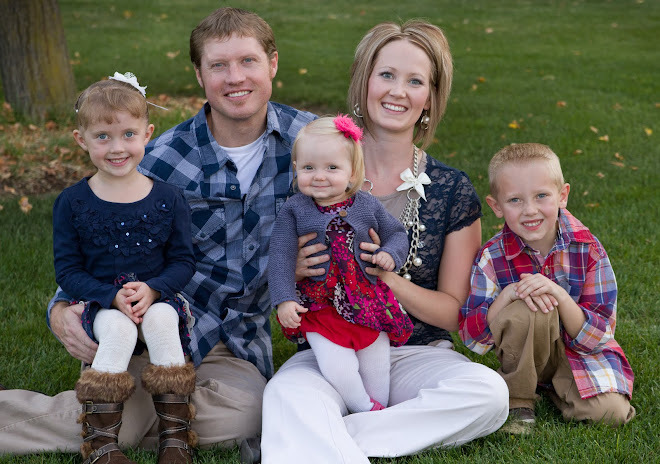 But alas, the Wilcox family found an opportunity to move to Pocatello, closer to family. It was a sad time for all of us especially when you're left wondering if such a great friendship will just completely slip away. Thankfully that has not been the case. Between our two families, we have found opportunities to stop by and visit one another (us on our way to or from a visit to family and them on their way to or from a visit to family members that live in Washington). We were lucky enough to have them stop by in March on just such an occasion. Above you'll see the creativity of all those girls as they tried to put every bow/clip we own into Vanna's braided hair. Pretty funny. As you can see, our families have grown. We've had Rosie of course and the Wilcox family finally added two boys to the mix. Here's a picture of the whole lot. It was so good to see you guys again. Come again soon! We made a trip to see grandparents in February, near Valentines Day, which is always a treat. Speaking of treats - Grandma is always sure to spoil them with something! Vanna's actually pretty good at balancing on her head! And Rosie...well, she tries her best! So cute!